Top running back recruits at Scout Trout Elite are also ranked on CollegeFootballToday.Org's top RB recruit rankings. 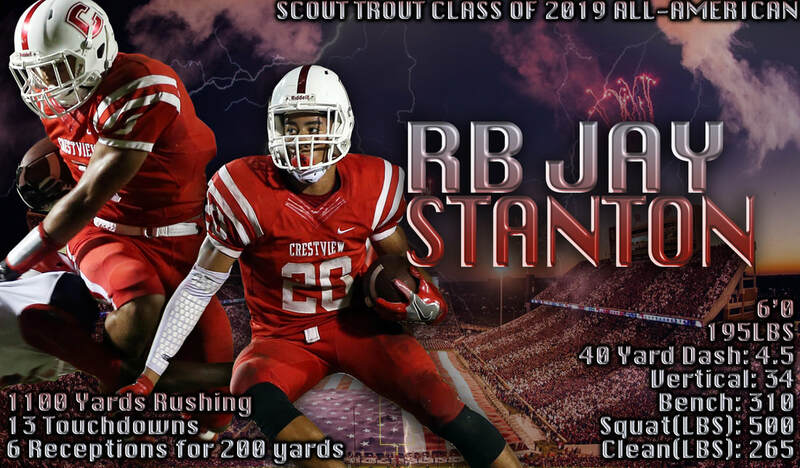 ​Player Notes - Jay Stanton is Scout Trout's number two overall rated All-Purpose Back, as he defines what a stand-out "ALL-PURPOSE" player should yield to the eye. This Every Down Back is very explosive and waste no time driving the football directly into the heart of a defensive unit. Jay Stanton can line up all over the football field and was able to rush for 1100 yards and 13 touchdowns, while hauling in 6 receptions for a whopping 200 yards (33.3 avg) and 2 receiving touchdowns. 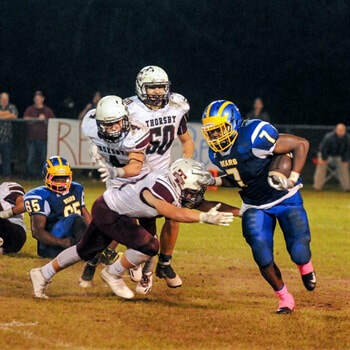 ​I want to thank Jay for accepting his nomination for our Scout Trout All-American Bowl and, as always, KEEP GRINDING! Player Notes - Jayveon Ross is a very shifty and explosive downhill runner out of East Wilkes HS, NC. He is a standout student-athlete on both sides of the football and shows the power needed in his running style to excel at the next level. 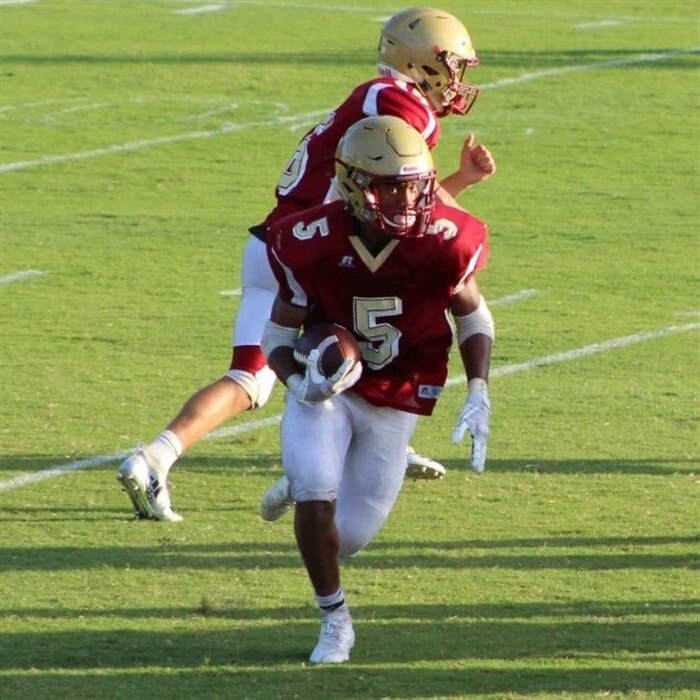 His quickness through the hole is very visibly seen in a recent match-up against North Wilkes, where Jayveon is seen bursting through the hole before the defense knows what hit them. Jayveon has been nominated as a College FB Today 2019 HS-All-American, as the week 3 poll begins. Levi Thomas is a big and physical running back, who also possesses game breaking speed. With the ability to line up and smack you square in the mouth, as a linebacker or fullback, as well, Thomas is a big time prospect that will be at our Scout Trout All-American Bowl weekend! 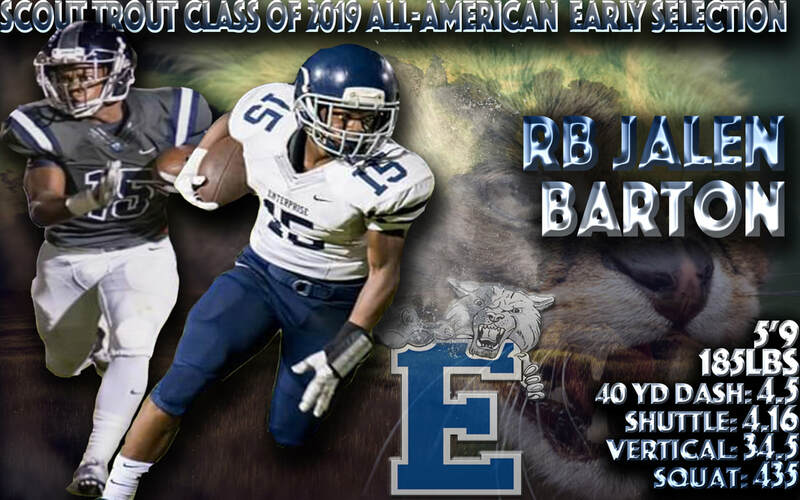 Player Notes - Jalen Barton comes to the Scout Trout All-American Bowl roster from Enterprise High School in the great football state of Alabama! Barton is an extremely fluent and gifted runner when working out of the Gun-Spread formation and is able to hit the designed running lane with great acceleration, which is combine with a very powerful style of running. When used in short yardage or down by the goal line, Barton will slice through your defense, as he often gets through the hole so quickly, the defensive linemen are not even out of their stance yet! Once he arrives at the "second level", the linebackers are in for a tenacious battle, as Jalen Barton will not be deterred from his final destination! Player Notes - Garret is a extremely quick and physical running back who possesses the skill to take over a football game for his ball club. 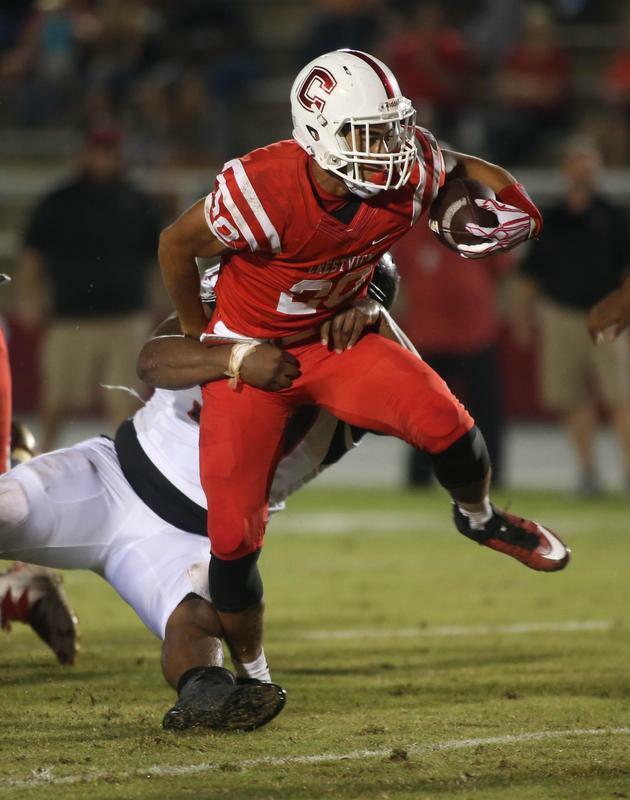 He has great overall athletics and had 1,369 yards on only 210 rushes.Garrett will grade out extremely well in our 2020 Top football recruits at College Football Today and has extremely impressive body of work thus far on his young career is one of the best we have seen in the 2020 college football recruiting class. Garrett will be added to our 2020 College Football Today top football recruits, as he exemplifies what it takes to succeed at the next level of College Football Today. Updated Stats - 1369 yards on 210 Carries - Junior Season 10 games. Offensive Player of the Year Central Buckeye Conf. Player Notes - Stanton Hayes is a dynamic and explosive athlete from the beautiful state of Washington, and shows tremendous overall athletics as a Student-Athlete. Hayes excels in all three phases of the game and reminds me of a Tyrann Mathieu as a defender and shows the ability of a Brian Westbrook (Eagles), as a ball carrier. Not much more needs to be said about this extremely versatile athlete, as we will have a full scouting report very soon! 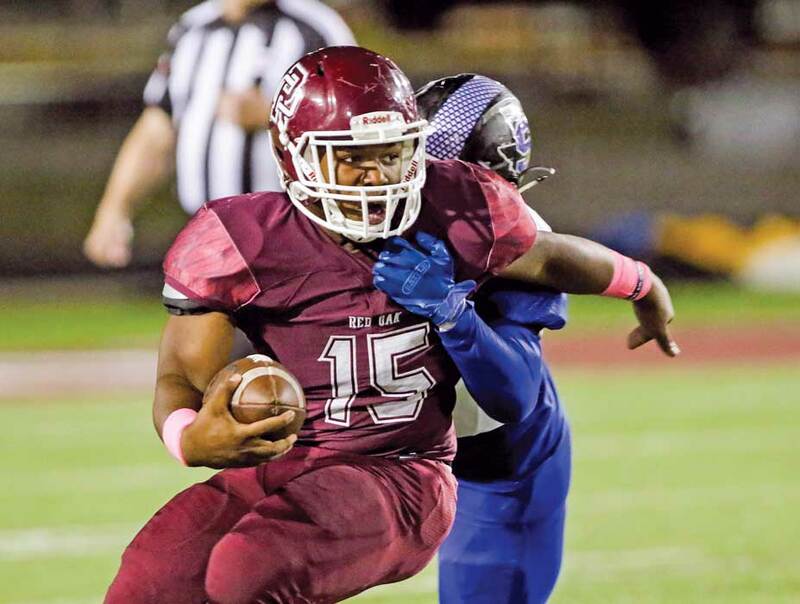 Player Notes - Palmer is a big athletic power back who was able to rush for nearly 100 yards a game his sophomore season in the great football state of Texas! 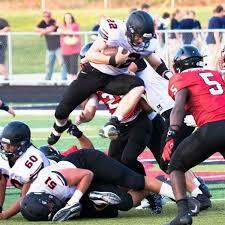 Charles had a breakout game against Athens and was able to go for nearly 250 yards and 3 touchdowns. He is able to bench press 300lbs ten times and is extremely hard to tackle with his low center of gravity. His 4.8,40 speed at 200LBS will only improve the next year and he will be a thousand yard rusher this season. We are extremely pleased to welcome one of the best looking power backs out of Red Oak High School in the football talent rich state of Texas! Player Notes - With extreme acceleration and quickness, Marnel Nelson is one of the few Class of 2021 back's I have seen be able to find the cut-back lanes so precisely. Once he hits his last gear, this young man is hard to catch and is a very powerful back that is very tough to bring down. With a brilliant upside and stellar academics, Marnel Nelson will prove to grade out highly in our S.T.E.P ratings, as we move forward to our future classes. 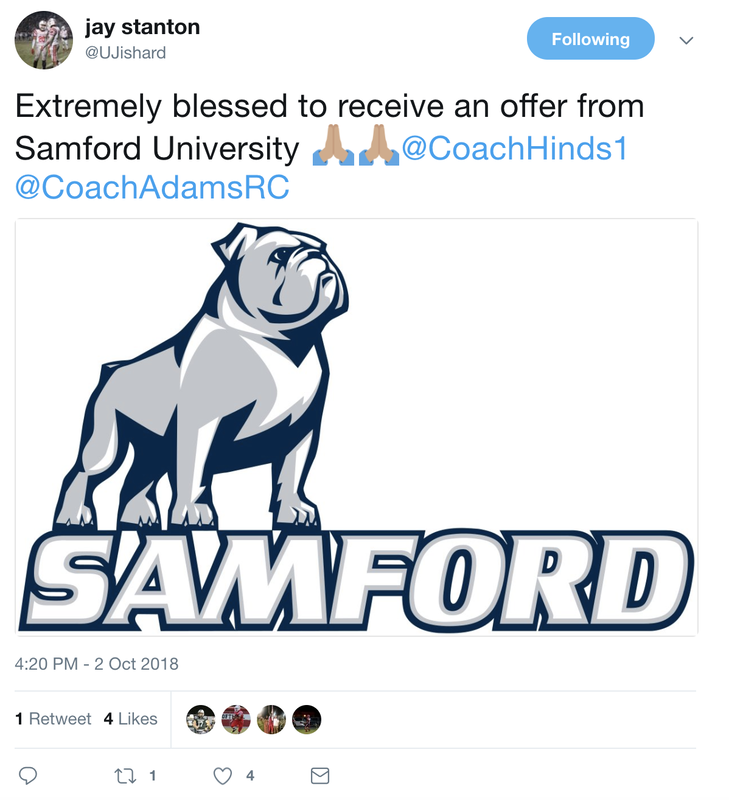 Player Notes - Alexander Diggs is certainly one of the top running back recruits in the 2022 college football recruiting class. He is one of the most gifted downhill running backs I have witnessed on tape in most recruiting classes I have evaluated. Considering he is making all of this magic as a true freshmen in high school on his YouTube highlights, Diggs has the potential to be one of the best running backs in the nation by his junior or senior season at College Football Today.